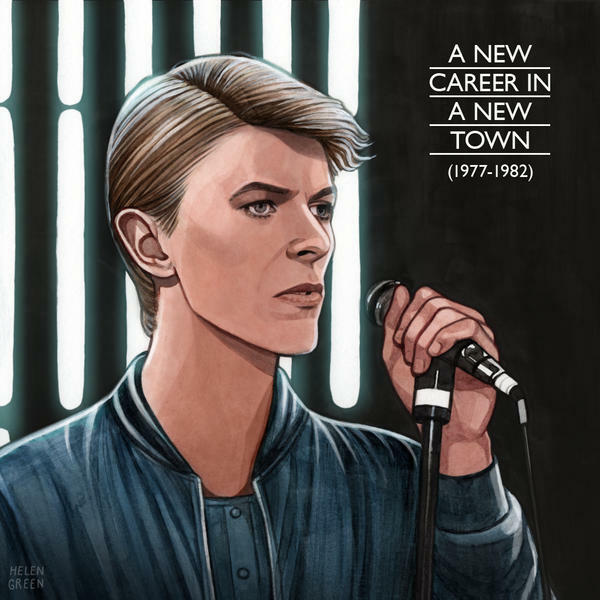 We’re celebrating today’s release of the David Bowie: A New Career In A New Town (1977–1982) box set with another superb Helen Green animation. View it over on DBFB and scroll the images here for individual stills. It joins three other Bowie releases in the Official Physical Singles Chart Top 20 right now. "Heroes" is also at #25 in the overall singles sales chart. Pretty good considering it was only released on vinyl and it's up against all those downloads, CDs, vinyl and the like by popular kids of today. Much gratitude to all of you for making it so. In October 1980, Fashion was released as the second of four singles from Scary Monsters (And Super Creeps). David Mallet directed again, this time inside New York’s HURRAH nightclub. The opening shot of the clip features Bowie and band on the HURRAH stage which was draped in khaki canvas for this shoot. The faceted mirror walls surrounding the dance floor can be seen in the background of various shots, and all the band scenes are shot in this club setting. Some of the dancers can be seen doing the 'shaker dance' reemployed for the Blackstar video in 2016. Record Mirror readers in the UK voted "Fashion" and "Ashes to Ashes" the best music videos of 1980. Watch the full Fashion video here. FOOTNOTE: The Bowie concert performance of Station To Station featured in the movie Christiane F., was filmed at the same club in NY the day before Fashion. This was because DB was performing in the Elephant Man on Broadway several nights a week at the time, and could not shoot in Berlin. The mass concert scenes were actually from an AC/DC concert in Germany and the audio of Station To Station accompanying the performance was lifted from Stage. Released in August 1980, the Ashes to Ashes single was accompanied by one of the better known Bowie promo videos, not to mention one of the most truly ground-breaking and hugely influential videos to boot. Bowie retained the services of David Mallet for this Bowie/Mallet-directed short (Bowie’s first credited direction), to promote the lead single from the forthcoming 1980 album, Scary Monsters (And Super Creeps). Ashes to Ashes was at the time the most expensive music video ever made and remains one of the most costly of all time. It incorporated scenes both in solarised colour and a new black sky effect, used by Mallet for the first time. Featuring Bowie in the Natasha Korniloff Pierrot costume that became the dominant visual representation of both the Ashes To Ashes single and the Scary Monsters album, the film also brought Steve Strange and other lead players of the burgeoning New Romantic London Blitz scene to the public eye. The costal scenes were filmed in May 1980 at Pett Level, East Sussex, with one of the most memorable being the shot of Bowie and the Blitz Kids marching towards the camera in front of a bulldozer, which Bowie later described as “symbolising oncoming violence”. Other moments included Bowie (revisiting Major Tom, perhaps), in some kind of black rubber space suit, seated in a space vehicle chair. This all takes place in an exploding kitchen, as a female nurse fusses around in the background. This scene and another in a high-ceilinged padded cell were first utilised in Bowie’s performance of Space Oddity on The Kenny Everett New Year Show in 1979. Filmed in September 1979, it wasn’t broadcast until December 31st, 1979. Both scenes were recreated for the May 1980 filming of Ashes To Ashes, the continuity experts among you will notice the very obvious differences. Ashes To Ashes closes with Bowie/Major Tom (?) in some kind of protective suit with life-support hoses coming from him in a womb-like cocoon of a room, that had a distinct flavour of H. R. Giger’s designs for Alien, a film released the previous year, which Bowie loved. The final scenes also included the Bowie Pierrot and an elderly woman lecturing him as they strolled along the beach to the fade out of “My mother said to get things done, You'd better not mess with Major Tom”. This prompted people to think it was Bowie’s real mother in the video, it wasn’t. Though what it actually was, was a recreation of the old lady with Pierrot as depicted in George Underwood’s painting on the back of the David Bowie Phillips album (AKA, Space Oddity). Watch the full Ashes To Ashes video here. FOOTNOTE: Michael Dignum tells of a hilarious moment during the filming at Pett Level, which Bowie purportedly recounted to him during the making of Miracle Goodnight. It’s full of fruity language though, and therefore not for the faint-hearted. Just the two singles, Boys Keep Swinging and DJ, were taken from Lodger in the UK. However, in July 1979 The Netherlands and Turkey enjoyed Yassassin, while the following month saw the release of Look Back In Anger as an A-side 45 in the US and Canada. Despite no other promotion (no pic sleeve, no press ads), the release was considered important enough to warrant another David Mallet-directed video, every bit as mad as the previous two promos. With a nod to Oscar Wilde's The Picture of Dorian Gray, the video may not have been a contributing factor to the record’s commercial failure. However, it’s hard to deny that as the film progressed Bowie wasn’t at his prettiest, albeit a look only achieved with the aid of make-up. Despite this, it’s a great video well worth another look. While you’re watching, listen out for Dennis Davis’s extraordinary drumming and see if you can spot Brian Eno on Synthesizer, Horse Trumpets and Eroica horn?! As today is all about the launch of the David Bowie: A New Career In A New Town (1977–1982) box set in Berlin, and while you’re waiting for the action there to start, it seems appropriate to exclusively reveal the October 2017 German Rolling Stone magazine cover, which, as we told you previously, has an exclusive Bowie feature and cover-mounted 7" vinyl single of "Helden"/"Heroes". This is the tracklisting of this future 33 1/3rd collectable. As David Bowie’s legendary album "Heroes" celebrates its 40th anniversary, the new issue of ROLLING STONE Germany contains an exclusive 7inch single: The vinyl features a live version of the immortal hit "Heroes" and the German version of the song. "Helden" was issued on the "Heroes" LP in Germany in 1977. Tobias Rüther takes a look at this germanised version of the song in his cover story, recalling the difficulties of translation and the pronunciation of the German language for non-speakers of it, even with the help of Antonia Maaß. ROLLING STONE also takes a closer look at Bowie’s life in Berlin in the Seventies: At the time the musician became one of the biggest heroes of the gay movement, Jens Balzer examines the artist’s influence on the LGBT music scene. Bernd Cailloux also describes what Berlin looked and felt like in 1977, he travels to the thriving underground and reflects on the city’s effect on David Bowie – and the singer’s impact on Berlin. The upcoming release of the David Bowie: A New Career In A New Town (1977-1982) box set (Friday, 29th September), will be celebrated today (Tuesday, 26th September), with an event at the world-famous Hansa Studios in Berlin, which will be live-streamed on www.facebook.com/davidbowie at 8pm CET (7pm BST / 2pm EST / 11am PST). The live event will feature a Q&A session with guests including Carlos Alomar (who played guitar with Bowie from 1974 to 1996), Edu Meyer (the former sound engineer at Hansa Studios) and Chris Duffy (son of photographer Brian Duffy, and director of the Duffy Archive), who will all be discussing Bowie’s work from 1977-1982. To commemorate the event and the release of the box set, from 11pm CET (10pm BST / 5pm EST / 2pm PST) tonight a special live digital E.P. will be on all major streaming services for a very limited time only. The E.P. features three previously unreleased tracks recorded live in Berlin on the Isolar II tour in 1978. Recorded live at the Deutschlandhalle, Berlin on 16th May, 1978. Photography by Antoine Loogman taken at the Deutschlandhalle performance. DJ, the follow up to Boys Keep Swinging and also taken from Lodger, was accompanied by another delightfully mad David Mallet-directed video, featuring Bowie playing a nonchalant DJ in a radio station studio, gradually smashing the place up. These scenes are interspersed with footage of Bowie rubbing shoulders and getting friendly with some of the wonderful people of Earls Court in London. The whole thing is topped off with our man as gas-masked art terrorist, spray-painting the DJ logo. Check out the full length video here. One of the very best 45s of all time (and another Top Ten hit for David Bowie in the UK) was the first single from 1979’s Lodger, Boys Keep Swinging. And it was accompanied by an equally brilliant video. The Bowie/Visconti produced tongue in cheek ode to the joys of gender stability, was a breath of fresh air in a musical landscape dominated by folk taking themselves a little too seriously. Both the humour and the role reversal of the recording (Guitarist Carlos Alomar played drums and drummer Dennis Davis played bass), transferred perfectly to the David Mallet-directed video (Mallet’s first in a string of classic Bowie promos, as you will see), with Bowie taking on the guise of his own female backing singers. If you’ve not had the pleasure yet, go and enjoy Boys Keep Swinging now. This is the second instalment of our album focus on David Bowie’s Scary Monsters (And Super Creeps). Here’s another snippet from Tony Visconti taken from the introduction of the Scary Monsters recording notes in the ANCIANT book. When we began ‘The Man Who Sold The World’ David and I jokingly said, “Let’s make this our ‘Sgt. Pepper’s’.” With every album we made together since then, we aired that silly phrase again. On reflection, when I listen to ‘Scary Monsters’ it feels more like we made our ‘Revolver’. Maybe it’s because the opening of ‘It’s No Game (No. 1)’ is a tip of the hat to the opening of ‘Taxman’. We were pushing the boundaries further than we ever had with this album. ‘Revolver’ took about nine weeks to make. We spent four weeks at The Power Station in New York and another five weeks at my own Good Earth Studios in London. There was a two-month gap in between as David said he needed the time to write the lyrics and melodies. David had written the ‘Berlin trilogy’ in the studio, sometimes whilst singing the lead vocal on microphone! This was a departure from procedure. Released in the UK as RCA BOWLP 2 (PL 13647) on 12th September, 1980. All songs written by DAVID BOWIE except ‘KINGDOM COME’ written by TOM VERLAINE. Recorded at THE POWER STATION, NEW YORK and GOOD EARTH STUDIOS, LONDON, by DAVID BOWIE and TONY VISCONTI in February and April, 1980. Assistants at THE POWER STATION, NEW YORK – LARRY ALEXANDER and JEFF HENDRICKSON. Promotional videos were made for Ashes To Ashes and Fashion. 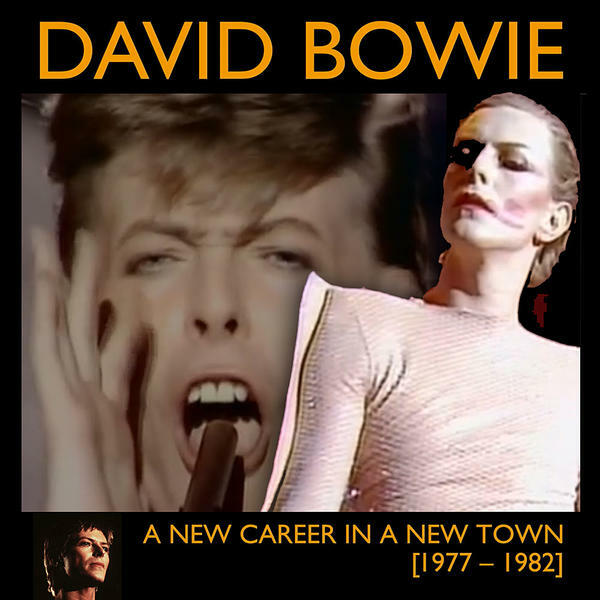 Listen to Scary Monsters on the official David Bowie: A New Career In A New Town playlist here. Day two of our daily look at the promotional videos Bowie made in the period covered by ANCIANT, perfectly timed for today’s 40th anniversary of the release of the "Heroes" single, more of which, later. Another sparse affair, the Nick Ferguson-directed "Heroes" promo film followed the feel of the previous two Bowie videos, Life On Mars? and Be My Wife, albeit in negative. As opposed to the bleached out white background, Bowie was dressed in dark clothing, backlit in a darkened room with no props. On Friday 23rd September 1977, David Bowie released the title track from his forthcoming album, "Heroes", as a 7" 45 backed by V-2 Schneider. The track has a rich history and a prominent place in popular culture, deservedly so. Apparently, Antonia Maaß also helped David with the pronunciation of the German version of "Heroes", Helden. It remains one of Bowie’s most covered songs, with a just released studio version by Depeche Mode joining the likes of (in no particular order), Arcade Fire, Prince, Blondie, Oasis, Nico, Depeche Mode, Motörhead, P.J. Proby, LCD Soundsystem, Peter Gabriel, Billy Preston, Janelle Monae, King Crimson, Philip Glass, Kasabian, Magnetic Fields, TV On The Radio, The Wallflowers and many, many more. The single was announced in the music press in the UK via news snippets and an enigmatic advert, bottom right in our montage. The video didn’t come till a bit later and certainly wasn't screened anywhere at the time of release. The performance on Marc Bolan’s TV show was broadcast five days after the release. Neither of RCA’s clever slogans: “Tomorrow Belongs To Those Who Can Hear It Coming” and “There’s Old Wave, There’s New Wave and There’s David Bowie” accompanied the UK single release (they came later with the album), and UK reviews weren’t too good either. So it’s not surprising that "Heroes" only managed a peak position of #24 on the Official UK Singles Chart. It’s not like Bowie himself didn’t do his bit in terms of promotion. Alongside lots of interviews, Bowie performed the song on different TV shows several times during the promotion. The record also came out in picture sleeves around the globe, though again, not in the UK. "Heroes" fared better in many other countries than it did in the UK, including top ten positions in both The Netherlands and Ireland. The album was received far better in the UK, but that’s another story. There were versions issued with German, French and English vocals, see the Helden advert and the French and German picture sleeves in our montage. This was the first time the title Héros was used for the French version. The "Heroes" limited edition 40th-anniversary 7" picture disc was issued yesterday via Parlophone, and we have a sneaky feeling it might fare a little better this time around than it did originally in the UK. FOOTNOTE: Eagle-eyed readers may have noticed the release date on the UK demo label in our montage of 23 AUG 1977. This was an RCA error and some of the copies were corrected manually in ballpoint pen! 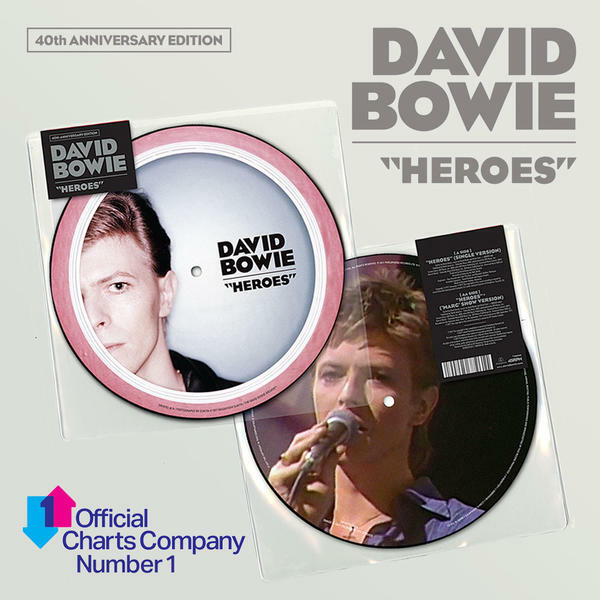 As if you didn’t already know, the "Heroes" limited edition 40th-anniversary 7" picture disc is issued today via Parlophone. The previously unreleased live version of "Heroes" from ‘Marc’ is a performance that remains dear to fans who heard it at the time, as it was the first televised performance of the song. Recorded on the 7th of September 1977 but not broadcast until September 28th, by which time Bolan had passed away in a tragic accident. 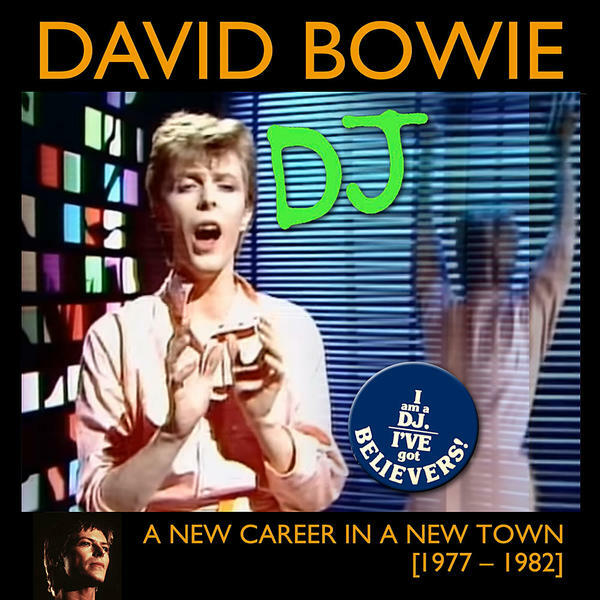 With just one week to go till the September 29th release of the David Bowie: A New Career In A New Town (1977–1982) box set, we thought we’d take a daily look at the promotional videos Bowie made in the period covered by ANCIANT. Originally released in the UK on June 17th 1977, Be My Wife was the 2nd and final single from Low. Despite a promotional video, the single didn’t chart, not helped by the fact that it was almost impossible to view it anywhere in the UK back in 1977. Filmed in Paris in June 1977, Be My Wife was Bowie's first official video since the Mick Rock-directed Life on Mars? film in 1973. Indeed, the Stanley Dorfman-directed Be My Wife had a feel of Rock’s production with Bowie performing against a bleached out white background, using a red Fender Stratocaster as a prop, while half-heartedly miming the guitar part. He somehow manages to appear nonchalant and anguished at the same time, in this bizarre plea for marital union. Apparently Bowie’s make-up and mannerisms in the video were influenced by the comic, Buster Keaton, whose work Bowie was a fan of. He would reprise the Keaton look for the Miracle Goodnight video in 1993 and even had a full page Steve Schapiro picture of the man in the Isolar Tour programme. Schapiro also shot a pic of Bowie holding the cover of a Keaton biography up to his face, inviting comparisons between the two. 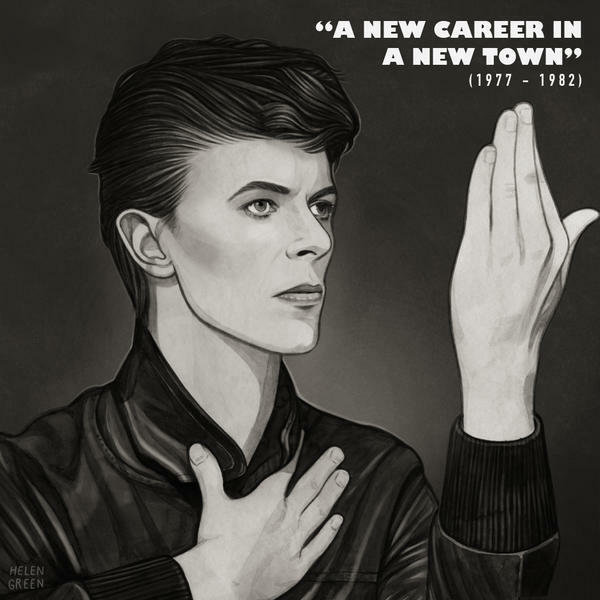 But during the spring of 2015, between work on Bowie’s final album, Blackstar, Visconti revived a long-cherished project to revitalise the oft-underestimated last instalment of “The Berlin Trilogy” (actually recorded in what Visconti describes as the “very unsexy” Montreux, Switzerland). The producer’s efforts have been rewarded with star billing in the new multi-disc box set David Bowie: A New Career In A New Town [1977-1982] and, more importantly his late employer’s own delight and approval. The full story of Lodger – its construction in exile, experimental excursions and crazy cover photo session – can be enjoyed in MOJO 288, along with new perspectives on Bowie’s Berlin period from Visconti, guitarist Carlos Alomar and Hansa Studios engineer Eduard Meyer. But among the tall tales of sleazy fun in the divided city’s bohemian demi-monde, there are more sobering insights. Also, free with the new issue is a 15-track covermounted CD, Neu Decade, celebrating the music that fed into Bowie’s Euro-exile – including Can, Cluster, Popol Vuh and Michael Rother. Go here for more detail regarding the November issue of MOJO, which is out on September 26th. In addition to tomorrow’s "Heroes" 7" picture disc release, Friday 22nd also sees the digital release of two new mixes of the song by Klax and Filburt especially commissioned for the 40th anniversary of the original single release. Listen to the tracks at NME and BEAT now. With just ten day to go till the September 29th release of the David Bowie: A New Career In A New Town (1977–1982) box set, the subject of our album focus this week is 1980’s Scary Monsters (And Super Creeps). Watch a clever little animation over on DBFB. Listen to the album on the official ANCIANT playlist now. Marc Bolan died forty years ago today on September 16th, 1977, two weeks before his 30th birthday. He was a close friend of Bowie’s right up until the last. The pair are pictured here when they appeared together on an episode of ‘Marc’, Bolan’s 1977 TV show. ‘Marc’ was recorded in Manchester on September 7th, 1977, and broadcast on September 28th, 1977. Today’s lyric quotation is from the song they wrote and attempted to perform together, Standing Next To You. However, the recording was truncated when Marc fell off the stage. Bowie also performed "Heroes" on the show, a performance that remains dear to fans who heard it at the time, as it was the first televised performance of the song. If the music of Marc Bolan and T Rex has somehow escaped you thus far, you really must treat yourself. And there’s no finer place to start than the Tony Visconti produced Electric Warrior. With just two weeks to go until the release of ANCIANT, we thought you might like to hear this previously unreleased live version of Suffragette City. The track was omitted from the original Stage album in 1978 and from the 2005 reissue. However, a tape containing this recording from 29th April, 1978, at the Spectrum Arena in Philadelphia, was uncovered during research for the ‘A New Career In A New Town’ box set.